When children were born, they took their mother's clan and you were forbidden to marry within your clan. The members of the same clan were considered brothers and sisters. The seven clans are: Wolf - (a-ni-wa-ya), Deer - (a-ni-a-ha-wi), Bird - (a-ni-tsi-s-qua), Longhair - (a-ni-gi-lo-hi), Wild Potato - (a-ni-go-da-ge-wi), Blue - (a-ni-sa-ho-ni), Paint - (a-ni-wo-di). One of the reasons the women were given the clans was that they were the givers of life. Other tribes have clans. 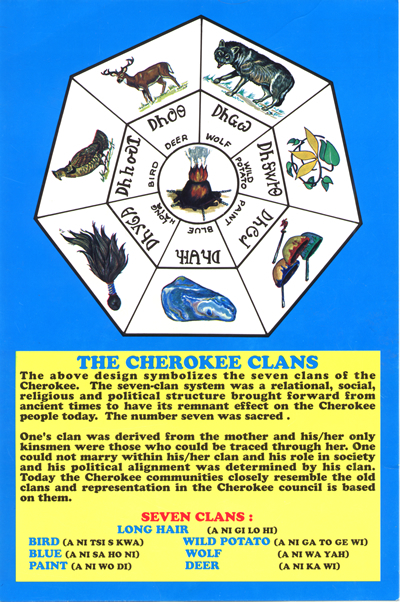 Some names of the clans are different and some are similar to the Cherokees. The women were free to choose the men they wished to marry, as long as they were from different clans. When a woman divorced her husband, she would pack all his clothes and set them outside the door --- it was that easy.